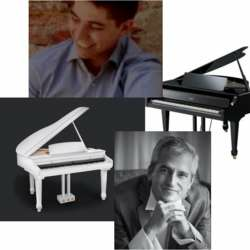 "Contrasts: Two Pianists and More"
We have a great opportunity to enjoy once more, the music of our friend and excellent pianist, Javier Herguera. He will delight us with a wonderful concert in the company of another fantastic pianist, Carlos Marin Rayo. On this occasion Javier will be accompanied by students from the CIM of San Lorenzo de el Escorial. But to add even more allure to the event, the “aperitive” of the concert will be the delightful duet of Javier Herguera and his violinist daughter Blanca Herguera. BLANCA HERGUERA Y JAVIER HERGUERA.